Every week in the world of wrestling garners some level of debate. It’s why we podcast. It’s why we blog. It’s why we Tweet. The wrestling fan is so overloaded with programming and information, and so vocal about the product they consume, it’s hard to tell if anybody is actually enjoying anything anymore. All too often we take the things we love much too seriously. I’ve been known to throw things during a N.Y. Giants loss, hell we’re all human. Wrestling fans are no different. In the age of social media and the internet, we are all guilty of having a quick trigger when commenting on the current state of wrestling affairs. What scares me though is as a die hard fan, have we forgotten how to enjoy wrestling for what it is? All I see everyday is fans arguing. If you like a different wrestler or watch a different promotion, it’s almost like putting a target on your back. When I was a kid, being a wrestling fan was like being part of a secret club. We had our own language, our own stories to tell. There was a sense of family. That doesn’t exist anymore. It’s too much “my dad can beat up your dad” or “This person doesn’t deserve to be champion.” We have forgotten how to come together as fans, and just have fun. We are still part of that small family who can find joy in the absurd. So as the 30th edition of Summerslam looms over this weekend’s horizon, I ask only one favor of you. Have fun!! Don’t get caught up in results. Don’t worry about guys getting “buried.” Don’t concern yourself with who’s walking in or out of Brooklyn as championship. We are primed to have some great matches on Sunday. Get comfortable, and for a few hours allow yourself to remember why you became a wrestling fan to begin with. Trust me, its not to argue with some jabroni in Cleveland about who deserves to be Intercontinental Champion. 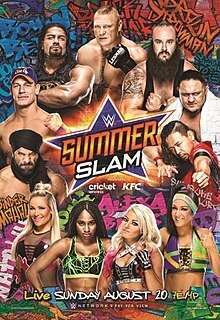 Hardy’s & Jordan, Orton, Big Cass, Corbin, Balor, Styles, New Day, Rollins & Ambrose, Natty, Alexa, Tozawa, Mahal, Strowman. Until next time, it’s the Maverick signing off.